AFC Wimbledon striker Adebayo Akinfenwa insists he is not concerned by his form after scoring just once in his first six appearances this season. The 33-year-old, renowned for his 16-stone frame, scored 15 goals in 52 outings for the Dons last season. 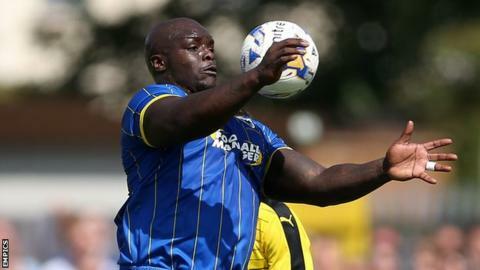 "I don't get hung up on that," Akinfenwa told BBC London 94.9. "Some people get caught up in the negatives. I look beyond the possibilities and try and defy limitations put on me." Akinfenwa is remaining relaxed as he took nine games to get off the mark for the League Two side in 2014-15. "I average about 15 goals [a season]," the former Swansea, Northampton and Gillingham player said. "On a personal note I'll be disappointed but if I am still doing what I do on the pitch to help the team win, I can't begrudge that." Akinfenwa, nicknamed 'The Beast' by Wimbledon supporters, has extra reason to score this season after asking fans to choose his celebration via an online vote. "It was a bit of fun at the start of the season. I feel like football can be very serious and I try to be light-hearted where I can," he said. "I gave them three choices and 'The Whip' got about 40,000 votes so that won. "My personal favourite is 'The Royal' and someone suggested to me that I incorporate the three during the season. "I hope people get to see the celebration more often than not, but I think I will change it up."